Can you believe it takes only 10 minutes to make a British royal dish? The Original Coronation Chicken is super easy to prepare, and makes a great condiment for anything from sandwiches, salads, baked potatoes or simply toasted bread! Heat the extra-virgin olive oil in a large frying pan over medium-low heat. Add in the onion, bay leaf and curry powder and gently cook for 2 minutes. Add in the tomato paste, red wine and water and bring to a gentle boil. Add in the lemon juice and a pinch of sugar, then season with salt and freshly cracked black pepper to taste. Simmer for 2 minutes, until the sauce is slightly reduced, then remove from the heat. Strain the sauce through a fine sieve and allow it to cool. In a large bowl mix together the prepared sauce with the mayonnaise, creme fraiche and finely chopped apricots. Add in the chicken breast chunks and mix gently all the ingredients together. Fold in toasted almond flakes if you like. 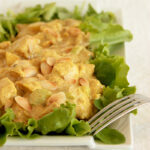 Serve the coronation chicken with a salad, rice or as a filling for jacket potatoes and sandwiches. Enjoy!